Yuan, J., Wang, T., Huang, X., and Wei, W. (2016). "Effect of wet-end additives on the results of alkyl ketene dimer sizing after adding bacterial cellulose," BioRes. 11(4), 9280-9289. Bacterial cellulose is a common research additive in the paper industry because it has unique and favorable characteristics. In this study, the effect of adding bacterial cellulose to an alkyl ketene dimer (AKD) sizing agent was investigated to optimize the dosage of bacterial cellulose, the retention system (cationic starch (CS), cationic polyacrylamide (CPAM)), and the sizing enhancement agents (polyamideamine-epichlorohydrin (PAE) and chitosan). The results showed that the addition of bacterial cellulose had a negative effect on AKD sizing. Meanwhile, the addition of 5% bacterial fiber had a slight but negligible effect on paper sizing. The retention system improved AKD sizing and the dual retention system with CS, and CPAM improved sizing up to 60%. When 0.2% PAE and chitosan were added simultaneously, the sizing degree increased by 42.8% and 47.6%, respectively. Bacterial cellulose (BC) is a fibrous material generated by microorganisms such as Gluconacetobacter xylinus (Jonas and Farah 1998; Ha et al. 2008). In comparison with plant cellulose, its most prominent advantage is its composition, i.e., 100% cellulose without any hemicellulose, lignin, or other plant cell wall components. Bacterial cellulose has excellent physical and mechanical properties, such as high crystallinity, high degree of polymerization, favorable mechanical strength, and excellent molecular orientation. In addition, BC has high water permeability, air permeability, and hydrophilicity because of its highly porous structure. To this effect, BC can absorb up to 700 times its dry weight in water, demonstrating a high water holding capacity and wet strength. The diameter of bacterial fiber is between 10 nm and 100 nm, and its tensile strength is high. Bacterial cellulose exhibits high biological adaptability and is highly biodegradable, having no direct threat to the environment (Watanabe et al. 1998; Bäckdahl et al. 2006; Hornung et al. 2006; Jeon et al. 2010; Ul-Islam et al. 2012). The unique properties of BC have generated research interest, particularly in regards to its use as an alternative functional material in papermaking applications. Bacterial cellulose can be used as a green paper additive in pulp to improve the physical strength of the resulting paper and its printing properties (Surma-Ślusarska et al. 2008a; Surma-Ślusarska et al. 2008b; Yang et al. 2016). Integrating BC after dyeing the pulp with plant fiber can facilitate an innovative anti-counterfeit paper with high strength and valuable identification qualities (Hasuo et al. 1994). Flame retardant BC produced from glucose phosphate along with glucose can be used to make fire-resistant paper (Basta and El-Saied 2009). Bacterial cellulose has also been investigated as a binder in parchment and banknote paper (Geyer et al. 1994; Suwannapinunt et al. 2007). The diameter of BC is very small, while the specific surface area is very large. The fiber surface cationic charge demand is ten times that of other plant fibers. Accordingly, the addition of BC may significantly impact the wet-end of pulp processing. To explore the effect of BC on the wet-end chemistry of pulp, this study investigated the workable wet-end chemistry theoretical reference for BC application in paper making. The BC sheets were produced by Gluconacetobacter xylinus from Yide food company (Hainan, China). Softwood, hardwood, and bagasse pulps, cationic starch (CS) with a degree of substitution of 0.04, cationic polyacrylamide (CPAM) with a molecular weight of eight million and charge density of 1.50 mequ.g-1, alkyl ketene dimer (AKD) emulsion with a solids content of 12.92%, polyamideamine-epichlorohydrin (PAE) with a solids content of 13.91%, charge density of 1.66 mequ.g-1, and chitosan with charge density of 1.55 mequ.g-1 were obtained from Nantang company (Guangxi, China). The CS solution was heated at 95 °C for 30 min at a 1% consistency before use. The BC films were treated with 0.3 M NaOH at 121 °C for 15 min to disrupt and dissolve the embedded microbial cells. Thereafter, fibers were washed thoroughly with distilled water until the pH of the water was neutralized (Ul-Islam et al. 2012). The BC wet films were first cut into small pieces (1 × 1 cm2) and then dispersed with a standard disintegrator operating at 10000 r. The water was removed with a 300 mesh nylon bag until a BC concentration of approximately 10% was reached. Thereafter, the BC slurry was refined in a PFI refiner (KRK, Japan) at a beating revolution of 30000 r. The BC slurry was stored at 4 °C until further use. Various dosages of dispersed BC in the softwood, hardwood, and bagasse pulps were mixed thoroughly, and 0.3% (relative to absolute dry plant fibers) AKD and other additives were combined to prepare handsheets (60 g/m2 basis weight). The BC dosages (relative to absolute dry plant fibers) were 1%, 2%, 3%, 4%, and 5%; the CS dosages (relative to absolute dry plant fibers) were 0.1%, 0.2%, 0.3%, 0.5%, 0.6%, and 0.8%. The CPAM dosages (relative to absolute dry plant fibers) were 0.01%, 0.02%, 0.03%, 0.04%, and 0.05%. The sheets were aged in an oven at 105 °C and then equilibrated at constant temperature and humidity (25 °C, 50% relative humidity) for 24 h. The sizing degree of the resulting paper was measured according to the liquid permeation method (GB/T 460 2008). 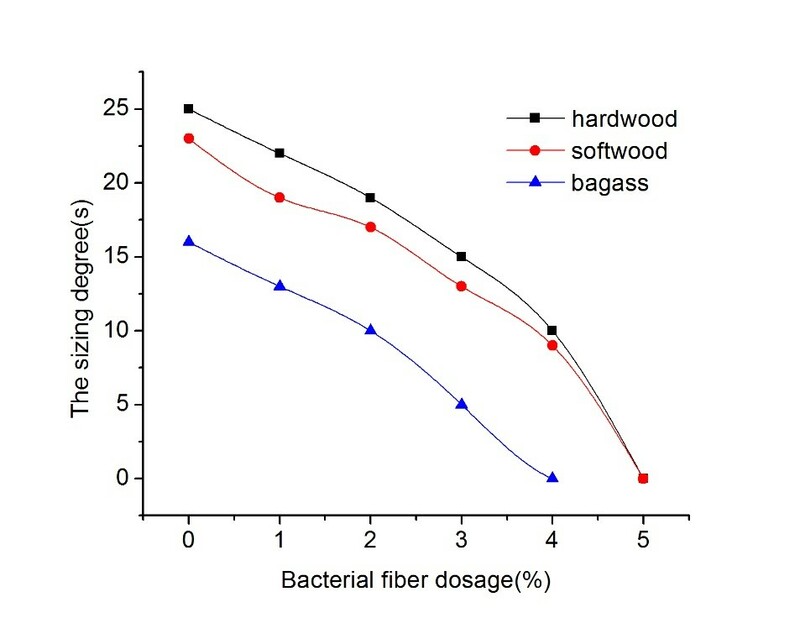 To investigate the effects of sizing enhancement agents (PAE and chitosan) and the aging process on AKD sizing, 3% BC and hardwood pulp were combined to produce paper under the same dosage conditions as other additives. The dosage of the sizing enhancement agent (relative to absolute dry plant fibers) was 0.05%, 0.10%, 0.15%, 0.20%, or 0.25%. The position that the agent was added is shown in Fig. 1. Papers need further aging to get corresponding sizing, the aging temperatures were 85 °C, 95 °C, 105 °C, 115 °C, and 125 °C and the aging time are 0.5 h, 1.0 h, 1.5 h, 2.0 h, and 2.5 h ,while other conditions were kept constant throughout the experiment. Figure 2 shows that the paper sizing degree decreased rapidly as the BC dosage increased in the absence of the retention agent. At a BC dosage of 5%, the paper exhibited no sizing. Further addition of BC increased the strength of the paper (Basta et al. 2009; Gao et al. 2011), but did not benefit the sizing aspect. The small diameter and large specific surface area of the BC fiber provided a greater negative charge at the fiber surface compared to other plant fibers, as mentioned previously. Therefore, the BC absorbed a significant amount of the AKD, which was then lost with the white water circulation, thus decreasing the paper sizing degree. Figures 2 and 3 showed that the bagasse pulp created the most neutral sizing and was less efficient compared to wood material sizing. It is generally accepted that short straw fibers, high fine content, miscellaneous cells, and ash interfere the chemical additives and are the primary cause of inefficient material sizing (Dai et al. 1999; Shen et al. 2001). Figure 3a shows that with addition of CS or CPAM individually exhibited varying degrees of improvement in paper sizing. When the dosage of CS was 0.5%, the sizing degree of paper reached 35 s, 34 s, 24 s, respectively. As the amount of CS increased beyond that point, the sizing degree remained constant. This may be because the CS adsorption and the retention of the fiber reached saturation at the 0.5% addition level. Cationic polyacrylamide is a polymer with many positive charges. It is known as an efficient retention agent that can retain small fibers and fillers in pulp through the patch mechanism and bridge line (Isogai 1997; Cho et al. 2001). As shown in Fig. 3b, when relatively minimal CPAM was added, the sizing degree improved substantially; sizing remained relatively constant with increasing CPAM addition, indicating that the amount of CPAM exhibited a negligible effect on the efficiency of AKD sizing. Although CPAM may improve the retention rate of fines and BC fiber, it does not improve the relative retention rate of AKD on the fiber’s surface. It is difficult to enhance the sizing degree by adding CS or CPAM individually. In Fig. 4a, the sizing degree was enhanced when the retention agents, CS and CPAM, were added together. Once CS, bacterial cellulose fibers, and plant fibers were combined, the negative charges were reversed to positive charges, and then these positive charges combined with positive charge patches and electrostatic attraction generated by negative charges from adjacent parts (Lee et al. 2002; Hubbe et al. 2009). Once AKD was added, the AKD emulsion particles increased in quantity on the surface of the fibers, and the final addition of CPAM combined with the previous CS addition, forming a dual retention system. Then, the loss of fine fibers (including BC) and AKD particles within the white water was reduced through coagulation and flocculation. These processes greatly improved the sizing of the resulting paper sheets. Figure 4b shows that the effect of bacterial cellulose on AKD sizing was lower with the dual retention system; however, as the BC dosage increased, the sizing degree continued to decline slightly. This may have occurred because of the portion of the fines; those that adsorbed AKD particles were lost in the white water cycle. Using the dual retention system, the high fine content was more likely unevenly distribute in the AKD and ultimately reduced the sizing of the paper sheets. Figure 5 shows that as the dosage of PAE and chitosan increased, the sizing degree of the paper was improved. Paper sizing was optimal at a PAE dosage of 0.25% with comprehensive consideration of cost and sizing of paper and approximately 66 s, which was a 60% increase compared to that of paper without PAE. As the chitosan dosage increased, the sizing degree of the paper sheets initially increased and then decreased at the chitosan dosage of 0.2% and the paper sheet sizing was 62 s.
These two types of sizing enhancement agents absorbed a large quantity of positive charges, neutralizing a portion of the anionic waste from the pulp and improving the retention rate of fine fibers which adsorb AKD particles (Hasegawa et al. 1997; Li et al. 2004; Hubbe et al. 2009). The sizing enhancement agents formed bridges between the negative charges on the surface of AKD emulsion particles and the negative charges in the surface of the fibers to promote the retention of AKD emulsion particles on the fiber’s surface (Lindström and Larsson 2008). Through these two reactions, the overall retention rate of AKD in the paper and the relative retention rate on the fiber’s surface were considerably improved. Because these sizing enhancement agents contained a large quantity of amine groups, they formed a network structure that affixed to the fibers. The amine groups also can form a strong chemical bond with the AKD molecules during the drying process. Because various wetting additives can affect each other and cancel out any benefit to the pulp system, they should be placed as far from each other as possible. Figure 6 shows that the different adding positions have disparate effects on paper sizing. The sizing degree was optimal when the sizing enhancement agent was added in position ② (Fig. 6). When PAE and chitosan were added at position ②, the sizing degree of the paper increased to 60 s and 62 s, respectively. Adding CS in advance can make BC fibers and fine fibers flocculate and reduce the anionic waste in the slurry. Subsequently adding the sizing enhancement agent and AKD can increase the total retention of the sizing enhancement agent and AKD and ultimately the total sizing degree of the paper. Different from previous results (Hubbe 2007), position ① was not the best addition location for the sizing enhancement agent. A possible reason is that when the sizing enhancement agent was added in position ①, a large quantity of the agent was absorbed by the BC and fine fibers; i.e., the agent was lost and the sizing effects were unfavorable. When the sizing enhancement agents were added in position ③, the sizing degree of the paper was similar to that of position ①; both were lower than the addition position ②. When the sizing enhancement agent was added at position ④, the sizing degree of the paper was the lowest. When PAE was added at position ④, the paper sizing decreased until to the approximate level without PAE because the sizing enhancement agent was barely absorbed onto the surface of the fiber. Furthermore, the free sizing enhancement agent was lost in the white water in the absence of the retention agent, failing to enhance the paper sizing. During paper production, paper sizing with AKD does not reach its ultimate extent when the paper sheet reaches the reel of the paper machine. A certain amount of time is necessary for the aging process to result in the desired sizing. Generally, aging takes place within the reel and rolls of paper under high-temperature conditions because high temperature favors AKD spreading onto the fiber’s surface. The esterification reaction between AKD and cellulose hydroxyl accelerates as the temperature increases (Wane and Germgård 2009; Song et al. 2012). As shown in Fig. 7a, when the aging temperature was 125 °C, the sizing degree of the paper with PAE and chitosan was 72 s and 76 s, respectively. After the addition of PAE, the aging temperature increased and the sizing degree decreased initially and then increased. The sizing degree was lowest at 115 °C. The PAE promoted the efficiency of AKD sizing and AKD hydrolysis (Hubbe 2007), which reached a maximum at 115 °C. After the addition of chitosan, the paper was sized very effectively at approximately 71 s at a lower temperature of 95 °C and the sizing degree remained stable as the aging temperature increased. As shown in Fig. 7b, the aging time of the paper with chitosan was the shortest, and it reached the highest sizing degree in 30 min and remained stable for the remainder of the experiment. The paper with PAE required a longer period of aging, requiring 90 min to reach the highest possible sizing degree. When the aging time was 2.5 h, the sizing degree decreased to 52 s, possibly because the ester bonds of AKD and fibers were destroyed. The addition of bacterial cellulose (BC) had a negative effect on alkylketene dimer (AKD) sizing of paper. When the amount of bacterial cellulose was 5%, the paper exhibited negligible sizing. The addition of CS or CPAM increased the sizing degree of the paper. Compared to adding CS or CPAM individually, the dual retention system of CS and CPAM notably increased the sizing degree of the paper with BC. The addition of PAE and chitosan in small dosages (0.2%) greatly improved the sizing of the paper. 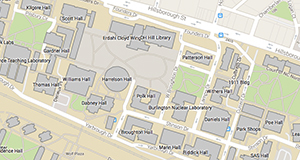 The optimal additions included CS, sizing enhancement agent, AKD, and CPAM in the appropriate locations. The project was sponsored by the Scientific Research Foundation of Guangxi University (Grant No. XTZ140551), the National Natural Science Foundation of China (B061103), the Guangxi Natural Fund (GXNSFFA019005, 2013) and (GXNSFBA118032, 2014), and the Guangxi Science and Technology Development Plan (1348013-2). Dai, H., Songlin, B., and Zhongzheng, Li. (1999). “A study on the characteristics of AKD sizing of wheat straw pulp,” China Pulp & Paper 11(6), 42-45. GB/T 460. (2008). “Paper-Determination of the sizing value,” Standardization Administration of China, Beijing, China. Hasegawa, M., Isogai, A., and Onabe, F. (1997). “Alkaline sizing with alkylketene dimers in the presence of chitosan salts,” Journal of Pulp & Paper Sciences 23(11), 528-531. Hasuo, K., Masuda, R., Sato, Y., and Outa, K. I. (1994). “Apparatus with anti-forgery provision,” U.S. Patent No. 5321470. Isogai, A. (1997). “Effect of cationic polymer addition on retention of alkylketene dimer,” Pulp Paper Science 23(6), 276-286. Lee, H. L., Shin, J. Y., Koh, C. H., Ryu, H., Lee, D. J., and Sohn, C. (2002). “Surface sizing with cationic starch: Its effect on paper quality and papermaking process,” Tappi Journal1(3), 34-40. Shen, W., Parker, I. H., Brack, N.,and Pigrams, P. J. (2001). “A simplified approach to understanding the mechanism of AKD sizing,” Appita Journal 54(4), 352-356. Song, X., Chen, F., and Liu, F. (2012). “Study on the reaction of alkyl ketene dimer (AKD) and cellulose fiber,” BioResources 7(1), 652-662. Surma-Ślusarska, B., Danielewicz, D., and Presler, S. (2008a). “Properties of composites of unbeaten birch and pine sulphate pulps with bacterial cellulose,” Fibres & Textiles in Eastern Europe 16(6), 127-129. Surma-Ślusarska, B., Presler, S., and Danielewicz, D. (2008b). “Characteristics of bacterial cellulose obtained from Acetobacter xylinum culture for application in papermaking,” Fibres & Textiles in Eastern Europe 16(4), 108-111. Suwannapinunt, N., Burakorn, J., and Thaenthanee, S. (2007). “Effect of culture conditions on bacterial cellulose (BC) production from Acetobacter xylinum TISTR976 and physical properties of BC parchment paper,” Suranaree Journal of Science & Technology 14(4), 357-365. Wäne, G., and Germgård, U. (2009). “Aspects on the AKD demand of hardwood kraft pulps before and after ageing,” Appita Journal 62(2), 123-129. Article submitted: July 14, 2016; Peer review completed: September 4, 2016; Revised version received and accepted: September 12, 2016; Published: September 14, 2016.